The ultimate goal of the CGIAR Big Data Coordination Platform is to harness the capabilities of big data to accelerate and enhance the impact of international agricultural research. This 6-year platform (2017 – 2022) will provide global leadership in organizing open data, convening partners to develop innovative ideas, and demonstrating the power of big data analytics through inspiring projects. "Data has become a valuable global commodity. But it is much more than simply information: in expert hands, it is intelligence. From forecasting presidential elections to predicting disease outbreaks, analysts are finding ways to turn big data — the immense stocks of information collected in computers worldwide — into an invaluable resource for planning and decision-making", - CGIAR Platform for Big Data in Agriculture. And it’s only just beginning... The smart use of big data will be central to achieving many of the United Nations’ Sustainable Development Goals. 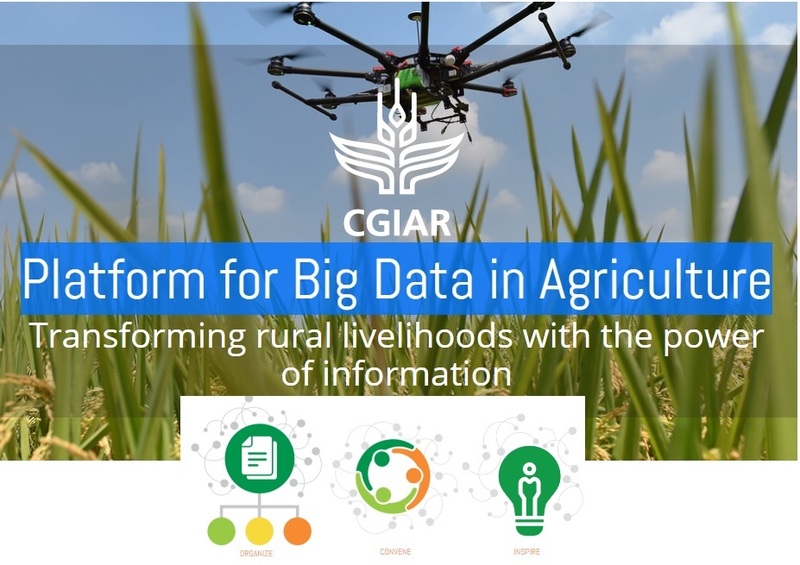 CGIAR is uniquely positioned to be a thought leader on the use of big data and information technology in agriculture to drive equitable rural development. Platform for Big Data in Agriculture will focus on enhancing CGIAR and partner capacity to deliver big data management, analytics and ICT-focused solutions to CGIAR target geographies and communities. The ultimate goal of the platform is to harness the capabilities of Big Data to accelerate and enhance the impact of international agricultural research. It will support CGIAR’s mission by creating an enabling environment where data are expertly managed and used effectively to strengthen delivery on CGIAR SRF’s System Level Outcome (SLO) targets. The Platform will achieve this through ambitious partnerships with initiatives and organizations outside CGIAR, both upstream and downstream, public and private. The 15 CGIAR Research Centers and 12 Research Programs are partners in the Platform, alongside 47 external partners (inluding Food and Agriculture Organization of the UN (FAO), CABI-GODAN) ranging international institutions, universities to private companies. They cover public to private, developing to developed country, and analytics to ICT deployment. The CGIAR Big Data Platform is seeking ambitious partners in the public and private sectors with an interest in the potential of big data to accelerate and enhance the impact of international agricultural research. As a result, CGIAR and partner capacity will be enhanced, external partnerships will be leveraged, and an institutional culture of collaborative data management and analytics will be established. Important international public goods such as new global and regional datasets will be developed, alongside new methods that support CGIAR to use the data revolution as an additional means of delivering on SLOs. provide support to the CGIAR and partners to fully comply with open data / open access principles, to address technical and organizational challenges, and to enable researchers to strengthen data analytical capacity and develop practical, big data-driven use-cases in a coordinated way. bring together big data practitioners, in partnership with global private sector brands, local upstart companies, universities, and others, in spaces that will encourage interaction and produce innovative new ideas to solve development problems. create opportunities for pilot projects that solve core development challenges and help scale them out. Using big data analytics and ICTs, we can provide unprecedented multi-disciplinary data to researchers, deliver information to farmers, monitor the state of agriculture and food security in real time, and inform critical national, regional and global policies and decisions.